Aurelia rides her new adaptive tricycle! Aurelia is so happy! 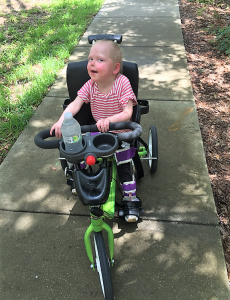 She was able to ride her new adaptive tricycle for the first time and she can’t get enough of it! This sweet 4-year-old is diagnosed with metachromatic leukodystrophy, an inherited genetic disease which damages the nervous system. She is unable to walk and has had a bone marrow transplant. The tricycle gives her independence and makes her feel like a normal 4-year-old. She is care free and happy when she is on her new tricycle. Aurelia lights up a room when she is in it! She enjoys various activities including going to the park and feeding the ducks. She enjoys listening to all types of music and her favorite singer is Taylor Swift. On occasion, her family takes her to her favorite restaurant-the Olive Garden. She loves the Alfredo! Aurelia’s mom says it’s hard to get Aurelia to smile, but since she received her new tricycle, she is all smiles. It means the world to her and it has improved her quality of life! Keep riding Aurelia!